One of the many questions that I get on a day-to-day basis is “what is Ener-G egg replacer and where is it available”. I thought that it was high time that I addressed this question here instead of replying to each and every mail individually. What is Ener-G egg replacer? Ener-G egg replacer is one of the many commercially available egg substitutes in powder form. Unlike the liquid egg substitutes which are actually made with eggs, these egg replacer powders do not contain eggs making it safe for people with egg allergies and suitable for people who do not consume eggs for any other reason. Apart from Ener-G, there is one from Bob’s Red Mill, Orgran from Australia and other local brands too. Ener-G egg replacer is a combination of potato and tapioca starch, leavening agents and other chemical ingredients. It is vegan, gluten-free, wheat-free, dairy free and soy free just to mention a few. Check here for the detailed product description. As of now I have used only Ener-G egg replacer and have found that it works best in cookies. 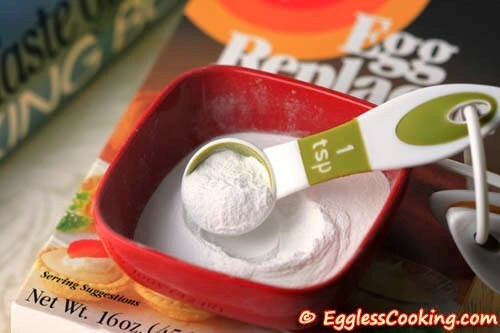 I have tried it in a couple of cake recipes too but if you want to create an egg-free version of your favorite cookie/s recipe then Ener-G egg replacer should be your solution. Now to answer the “where?” part of the question. In the US, I was able to find Ener-G in the organic aisle of the regular chain of grocery stores like Giant, Wegmans etc. You should be able to locate it near allergen-free products and mixes. It is not refrigerated. So you should be able to locate it in a similar section of your local grocery store. Whole Foods and other similar health food stores should also be carrying it. You can check this list of stores where Ener-G is available in US. If you don’t find it anywhere then you can try ordering it online in Amazon or Ener-G itself. Visitors from Canada, you should be looking at similar places as well. Also check this list of Canadian distributors who deal with Ener-G products. I was able to find yet another brand of egg replacer here in Ontario. I will write more about it once I use it and if I’m satisfied with the results. Ener-G also has a list of international distributors. Check it out to see if the country you live has made the list. I most often get this question about where Ener-G is available in India, and my answer is “I’m sorry, I don’t know”. I think Ener-G egg replacer is not available there. So if you live anywhere in India and find it there, please send me an email or leave a comment on the blog. It would be of great help to the many others who are looking for it. Check this link to find how to use Ener-G egg replacer in your recipes. Here is the list of recipes using egg replacer powder as an egg substitute. I guess I have answered most of the questions relating to egg replacer powders. Please use the comment form below, if you have any further questions. I will either post my reply or include it in this post itself if it’s appropriate. Next RecipeWhat is whole wheat pastry flour? CAN I FREEZE THE EGG REPLACER POWDER to be able to use it past july 2018??? Love your site for these great recipes. Thank you. You’re welcome 🙂 Yes you can store it in the freezer and it should be fine. Can this be use just as a egg like for scrambled eggs? If not is there a good option you can suggest? Not Joshua. There is something called the The Vegg for such purposes. This is the first time I’m going to make a cake with the powder egg replacer. My recipe calls for 3 eggs… the box of egg replacer tells me I should replace one egg with 1tsp of replacer and 2T of water. It’s for a client… and i’m a little worried it’s not going to turn out. It depends upon the recipe Jennifer. I have tried 2 cake recipes with egg replacer and it turned out fine. I wish you had test baked it before doing it for your client. Yesterday I had been to Acme stores for grocery. I saw man Bob’s Red Mill brand products including Vegetarian Egg Replacer in the baking needs aisle. There were other brands for flour, but luckily I found this egg replacer alongside the flours. In my opinion, it would be easier to look up the store directory or the aisle names which mentions the products for all baking needs. Thank you very much Madhu. I’ll include it in the post. Is it available in Delhi. What type of precautaions are needed to store it and how much is equal to one egg? I wish you had read the post thoroughly because I have mentioned that I don’t know if it is available in India. Great post. I’ve been eyeing this product for a while; but couldn’t find it in stores. Did not want to order online. Will look again at Wegman’s. Is it refrigerated? And what’s the name of the replacer from Bob’s red mill? Thanks Deepika. It’s not refrigerated. You would probably find it next to specialty flours and allergen free stuff. Bob’s red mill is the name of the egg replacer.